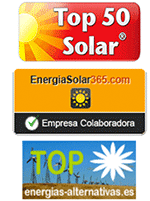 If you want to know how to buy solar panels for remote installations, you can find full version in our section guides. It is an electrical installation (which is wired and can plug loads) but has no access to the conventional electricity grid. The main thing is to know the energy we need to produce, and when we need it. We have to answer: What are you going to plug? How long will be plugged? Since we want to use it all year, we know that there will be minimal radiation where we are, it will be in December. Or if we want to have the same production all year modules must be oriented to the south and about 60 ° lift, so that production is maximized in winter, the sun is lower. Or if consumption is only in summer, adequate inclination is 30 degrees. As a rough guide for the module 60, in the south half of Spain in December they will have 2.8 hours of production, or equivalent peak sun. They are the hours that the sun would be 100%. To imagine that one day it will not load any of the panels, the energy we need should come from the batteries. The capacity of the batteries is measured for voltage Ah. 100Ah battery and keeps a 12V power 1200Wh. The battery needed to make the energy we need in three days corresponds to 50% of capacity. Modified wave inverters: are only valid if we want to "plug" is suitable for modified wave, if only without electric pumps and lighting electronics, can be used. Sine wave inverters: are valid for any electrical load, produce a like any home connected to the mains, often even better electric wave. Investors Chargers: They perform a dual function, that of a typical investor, plus the ability to charge the battery from an external source (network or generator). It is important to know what we need voltage; It must match the battery voltage. And it's important to know what we need to supply power. There are two ways to calculate it; add all the powers of all the "plug" and if we know that they will not connect at the same time, reduce it accordingly.